Over 15 years of elevator cab renovation experience and service. Concept Elevator has been operating on the principles of honesty, reliability, and personal service since our first elevator installation in 2003. The Anaheim Regional Transportation Intermodal Center, better known as ARTIC, provides rail, bus, taxi and other services for daily commuters, visitors and leisure travelers. Hands-on facility offers weather & technology exhibits, planetarium & wildlife centers. An iconic building situated in the World Trade Center Plaza in New York City. High-end chain boutique for own-brand designer watches; some also sell fine jewelry & leather goods. Sperone Westwater is a contemporary art gallery located at 257 Bowery, New York, NY, between Stanton and Houston Streets. The gallery stands one block north of the New Museum. 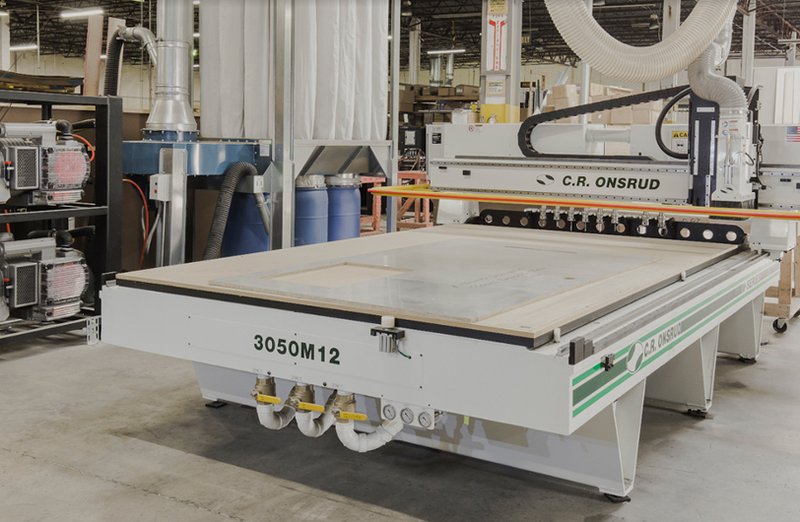 The CNC router is a precision cutting machine. It accurately cuts materials to various sizes and shapes with flawless lines. With computer accuracy and multiple tool heads it can form materials into clean precise panels. 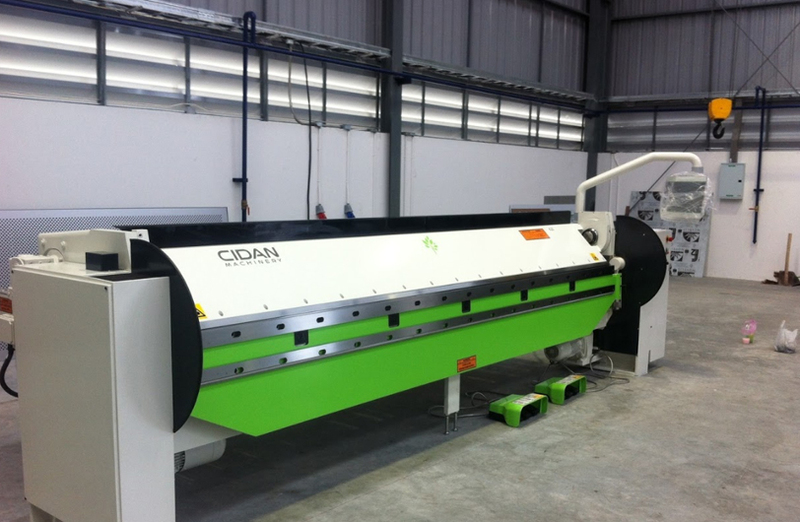 The Cidan folding machine can form sheet metal gently and effectively. Many different kind of operations can be done with the same tool setup. Big parts, small parts – no problem. 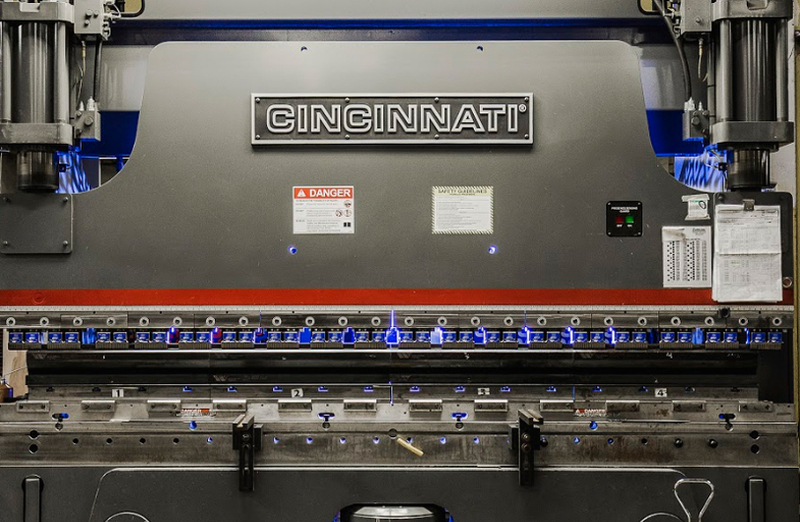 The Cincinnati press brake machine provides us with the best stainless steel angles with every hydraulic press. 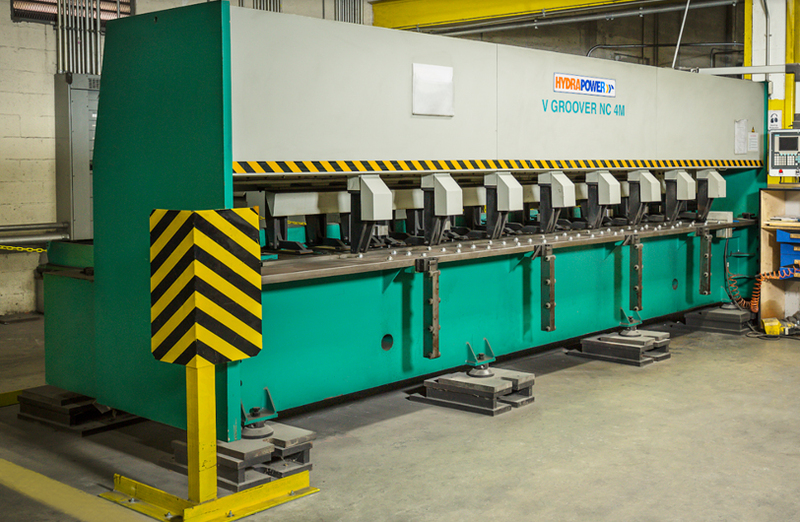 This machine has the ability to air bend 20 gauge mild steel into a vee die opening reaching an 90 degree angle frame. 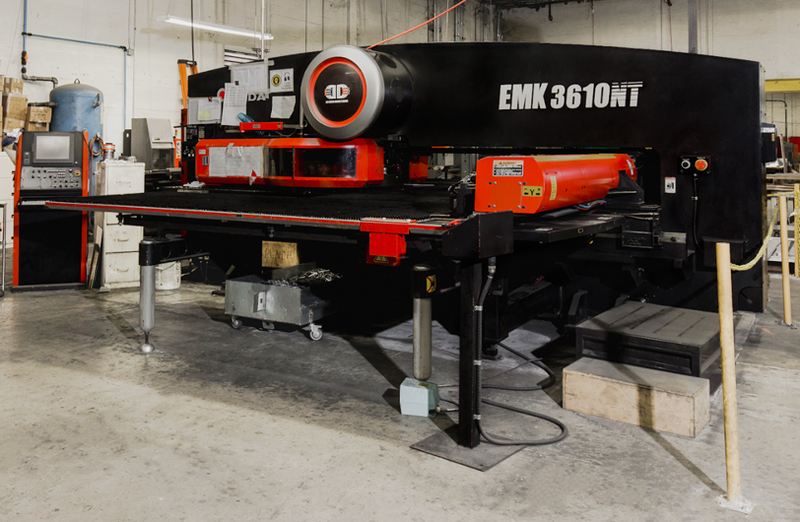 Amada 33 Ton Thick Turret punch press machine can process sheets up to 10′ x 5′ without re-positioning while motion controls speed, stroke length, and hold time. Without dramatic hydraulics and oil cooling chillers its able to reduce punching noise. 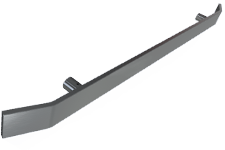 This is a precision cutting machine that cuts a V-groove for a tighter radius bend and crisp clean edge. This allows us to provide designs that very few can match. 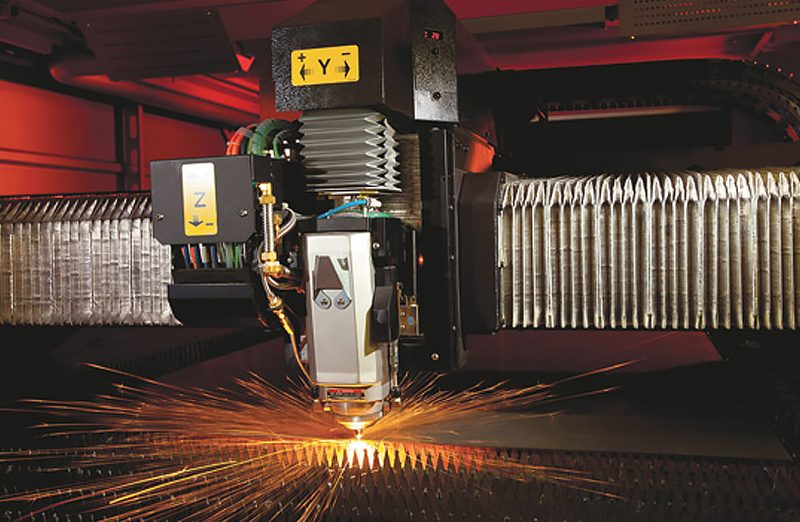 The Amada laser machine ensures a drive system with an upgraded processor build into their AMNC 3i control panel. Most high powered Amada Fiber Laser allows us to cut various thickness of metals into precision pieces with clean edges and perfect lines. The details and designs are only limited by our imagination. The company started with only 8,300 square feet of manufacturing space. Since then our products and customer service have grown our facility to over 30,000 square feet and even still we are growing. Our vision was to create a dynamic company that could be the best manufacturer of elevator cabs and entrances while maintaining the best lead times in the industry. Since our company was founded on quality and customer service, one of our first milestones was the completion of our ISO 9001-2008 certification. In addition to quality, our vision included product innovation. We have the ability to design products that not only meet the design intent, but products that minimize installation time and make our customers more competitive in the marketplace. Concept Elevator Group, LLC designs and manufactures elevator cabs and entrances while continuing to thrive on our focused customer service, commitment to excellence and our lead time consistency with every delivery at a competitive cost. Our intentions are to achieve market leadership by exceeding our customers’ expectations and creating quality consistency while simultaneously creating a work environment for our employees focusing health and safety as a top priority. Our values are recognized through safety, integrity and creating long term meaningful relationships with customers, suppliers, and employees. Great Sales Department! Easy to work with. We can’t thank Concept Elevator enough for helping us through this project with a very tight schedule. They are extremely helpful and get the job done in a timely manner.